I just returned from an amazing trip to Yellowstone National Park. Two of my friends, Paul and Ian, drove in from Seattle and met me there. They are two of my best friends so it's always a great time when we get together and shoot. I left late at night, planning on doing the entire drive all at once and making it to the park in the early afternoon. 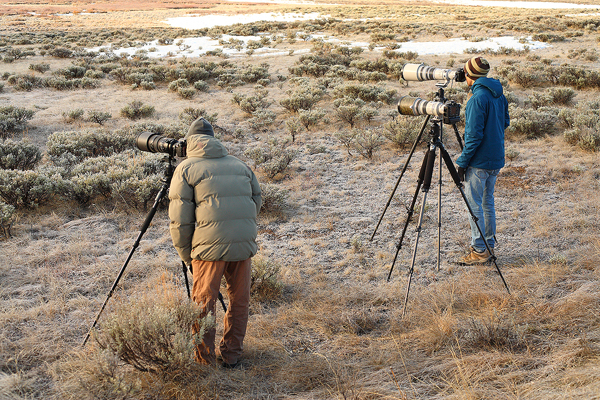 Paul and Ian met me the next morning for sunrise. 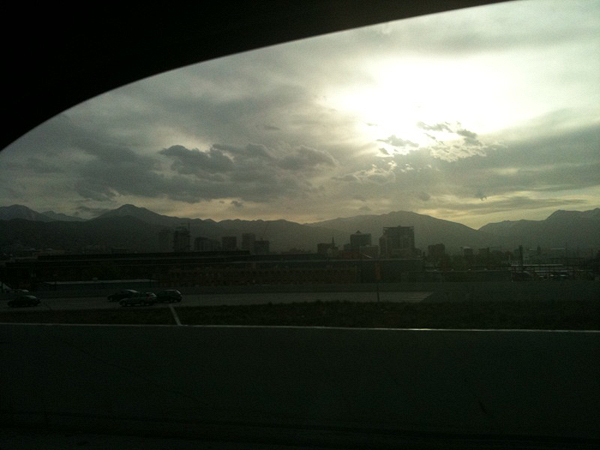 After about seven hours on the the road I found my self passing through Salt Lake City at sunrise. The daylight always gives me a much needed second wind on long drives. 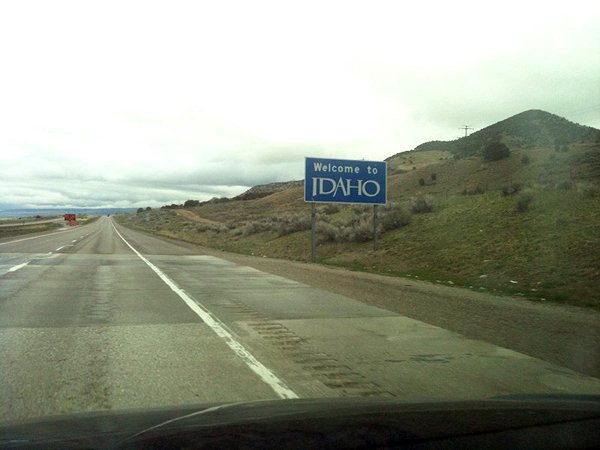 Three states down two to go. 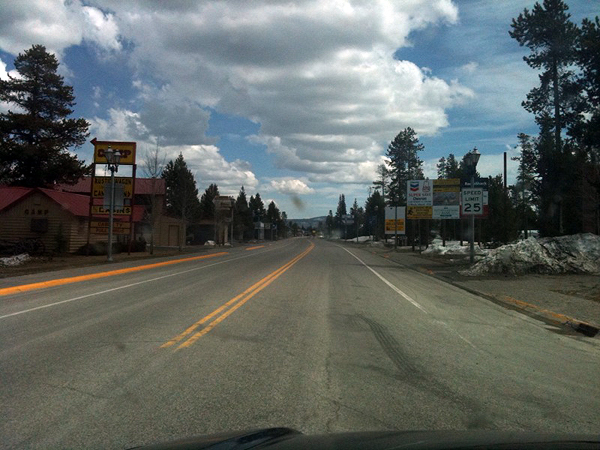 Finally made it to West Yellowstone, Montana. Feels good to be done with the drive! 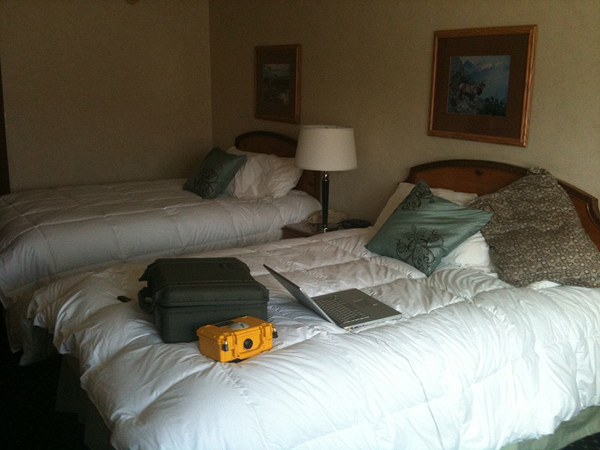 I drove around the park a little bit the first afternoon, but the lack of sleep made the hotel bed too irresistible. Time for a good nights sleep. Paul and Ian arrived before sunrise the next morning. 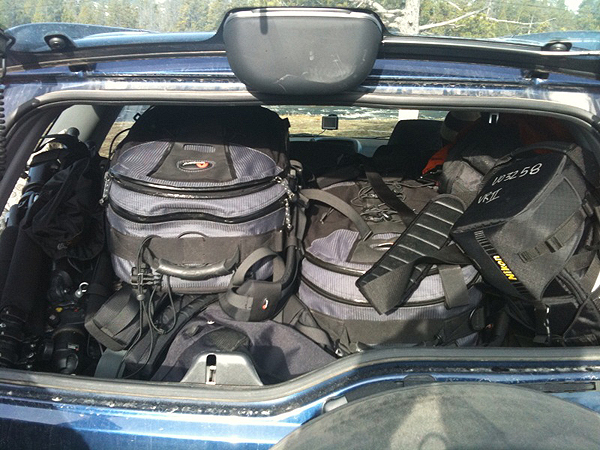 We packed up the car and headed out.
" 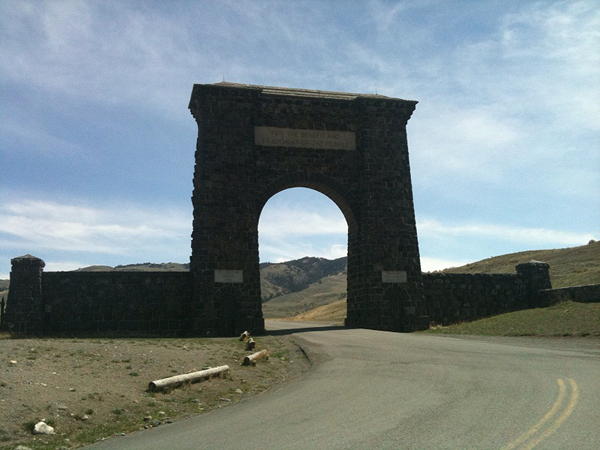 For the benefit and enjoyment of the people" This is the quote that is inscribed above the Roosevelt Arch leading you through the entrance to Yellowstone, Americas first national park.. The cornerstone of the arch was laid down by President Theodore Roosevelt in 1903. 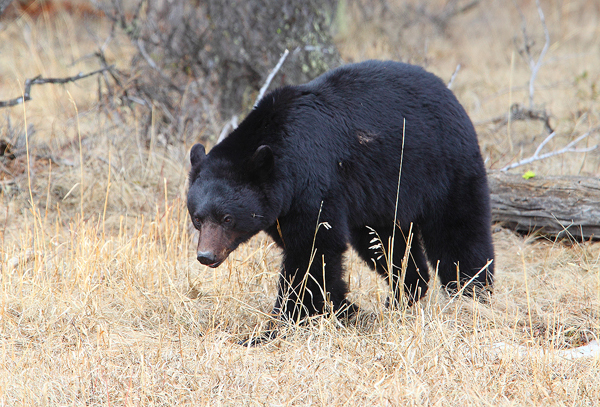 Our first sighting of the day was this beautiful black bear. 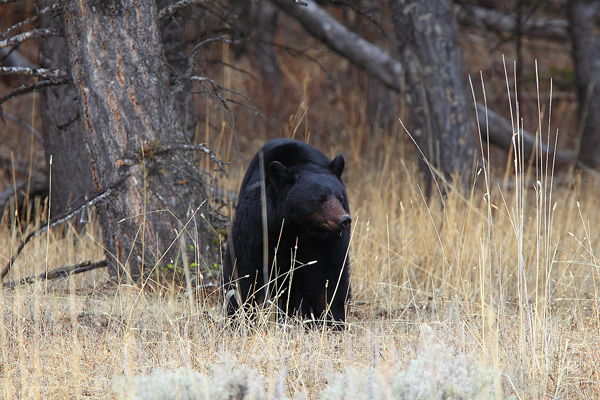 We observed this bear for about an hour as it worked the tree line looking for grubs. 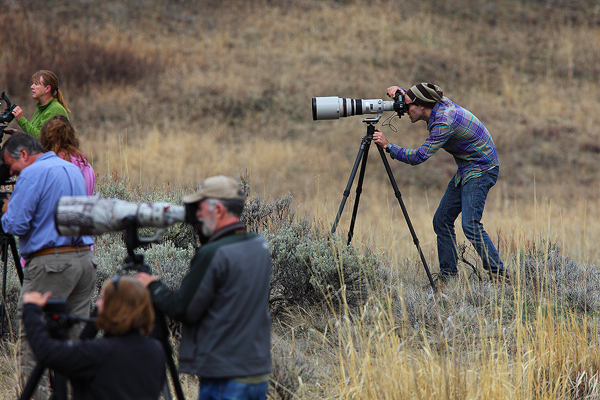 Ian with the bear paparazzi. 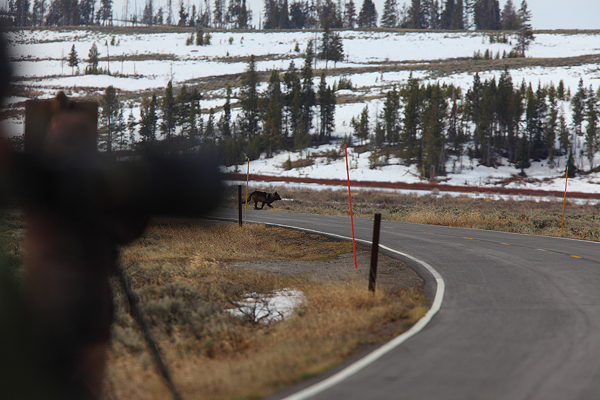 I've always had better luck with grizzlies in Yellowstone so I was delighted at the opportunity to observe this amazing black bear. 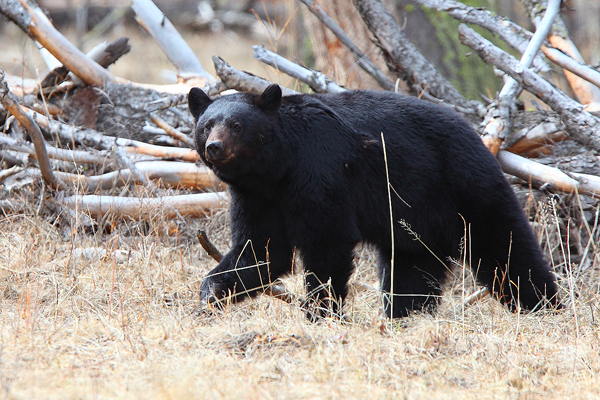 This black bear is searching the trees for grubs and any other morsels it can find. After we left the bear we made our way north. 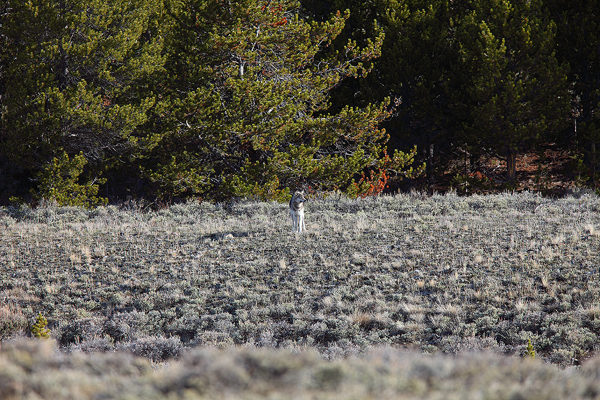 When we got to the Swan Lake Flats area we had our first wolf sighting of the trip. 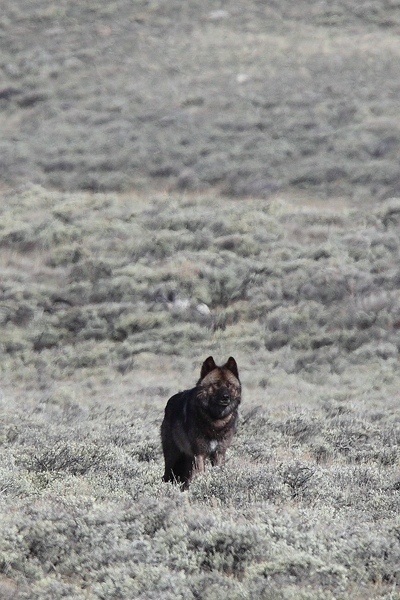 This beautiful black wolf was working on a bison carcass in a river nearby. We arrived just as he was leaving. Paul decided to walk in front of my camera. This was an exciting find, because we knew there would be a lot of action throughout the week on the carcass. 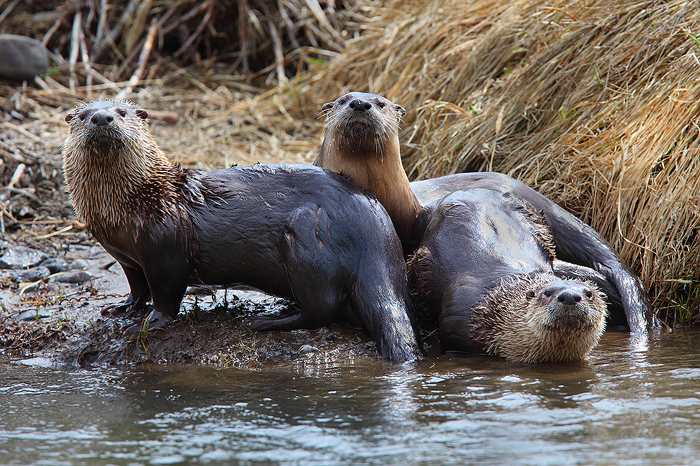 After the brief wolf sighting we headed on towards the Lamar Valley and were lucky enough to find 3 river otters outside of their den. They were weary of us at first, but their curiosity soon got the best of them and before we knew it they were posing for us. 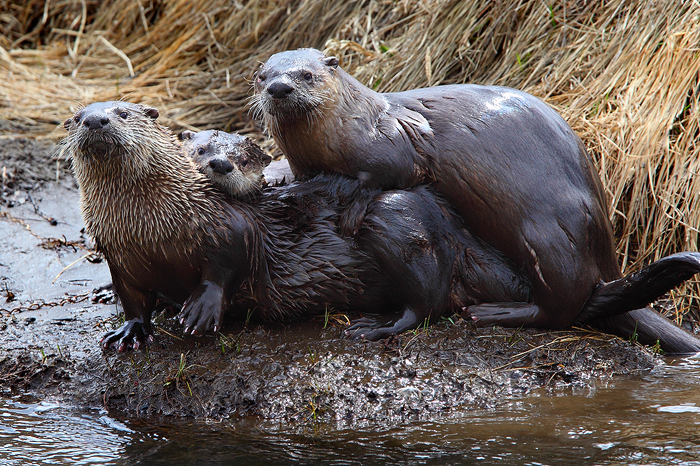 This was probably the highlight of my trip because while I've seen otters before, I've never had a decent opportunity to photograph them. Lots of fun. 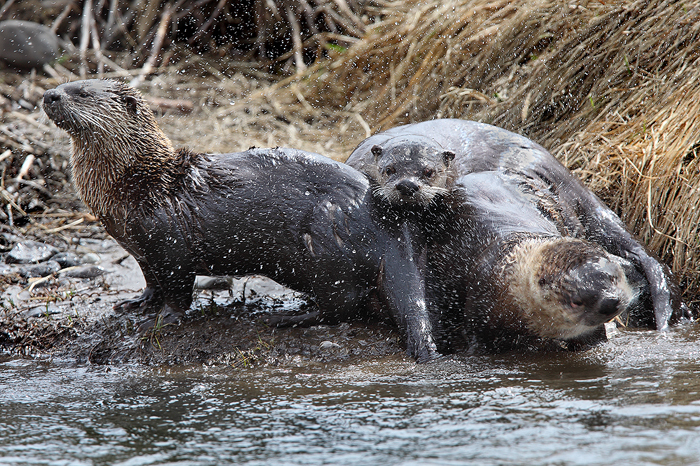 The otters were slipping in and out of the water and moving very quickly, as otters tend to do. They are great fun to watch. This is my favorite photo from our trip. 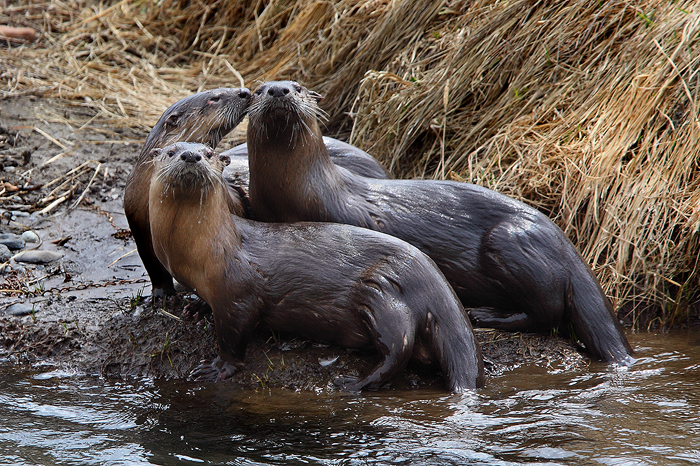 This was when we first spotted the 3 otters. At first they were very weary about us, but also quite curious. 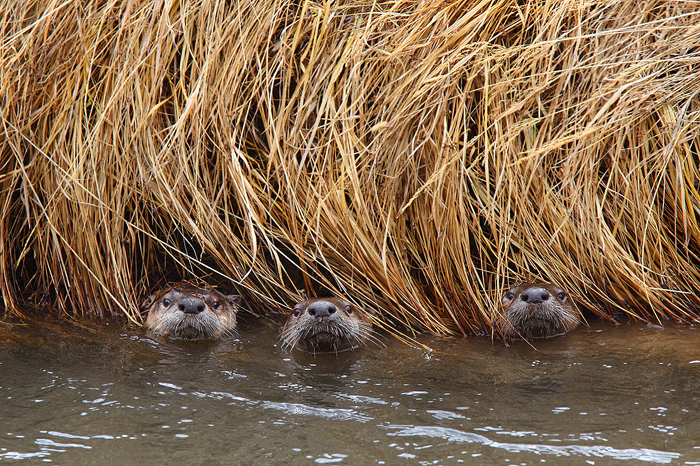 They peeked out at us from underneath the riverbank grasses. I love all the character in this image. 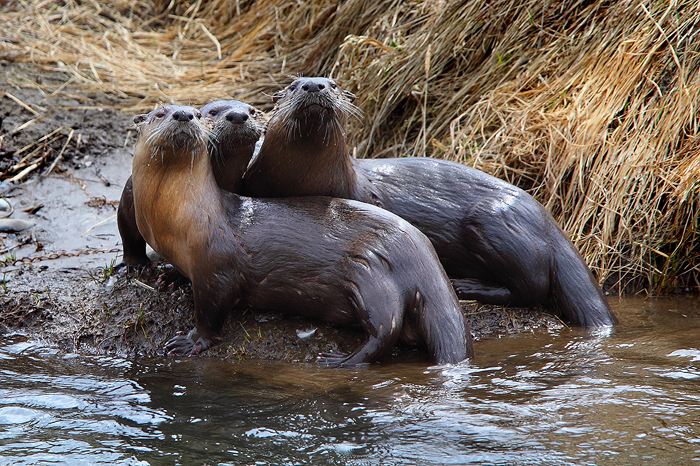 More posing from these hilarious little creatures. They seemed to be as entertained with us as we were with them. 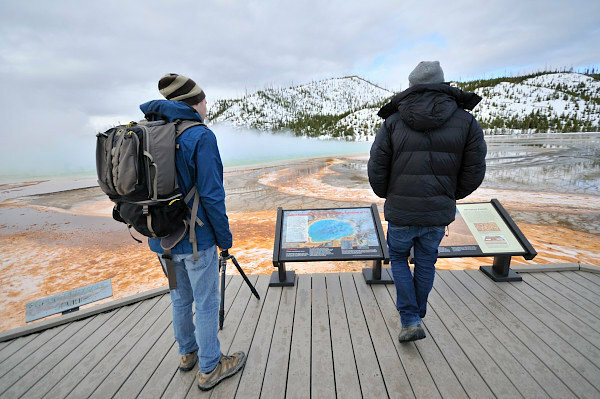 We headed back towards the west end of the park and had to stop by Grand Prismatic. 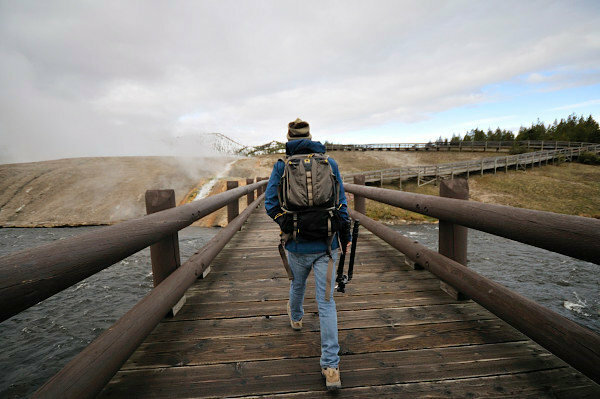 It's one of those special places that makes Yellowstone so unique and other-worldly. Photo courtesy of Paul Raymaker. Ian and myself checking out the spring. Photo courtesy of Paul Raymaker. 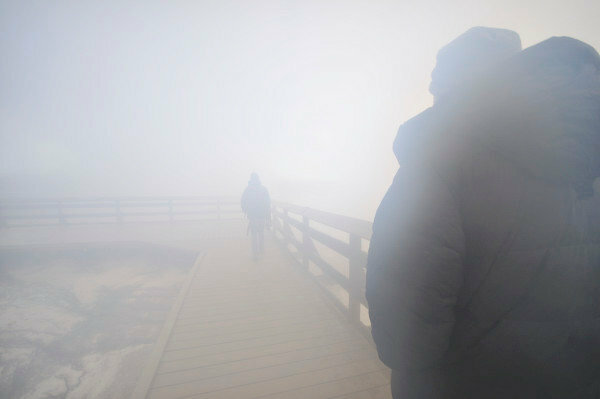 It's nice walking through the thermal fog on cold days. Photo courtesy of Paul Raymaker. After grand prismatic a quick but heavy snow moved through the park leaving a beautiful layer of new snow around the Firehole river. 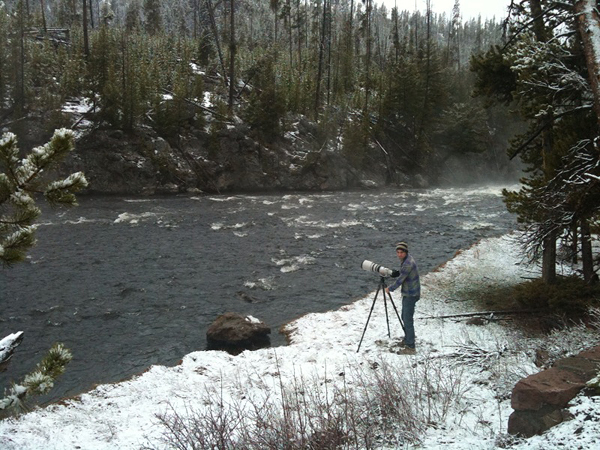 This is Ian photographing an osprey we spotted across the river with a fish. 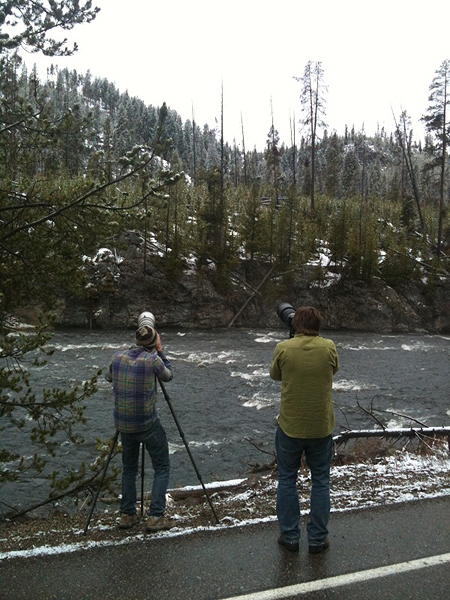 Paul and Ian photographing the osprey. The osprey... We watched this guy for a while. 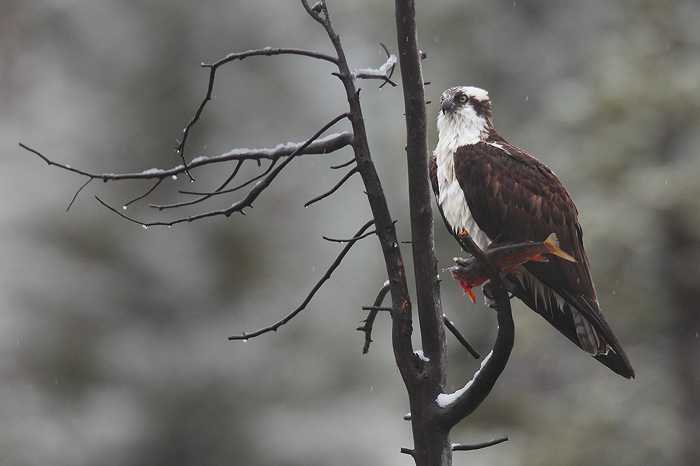 It held the trout in its talons, half eaten for a long time, eventually eating the rest of it. 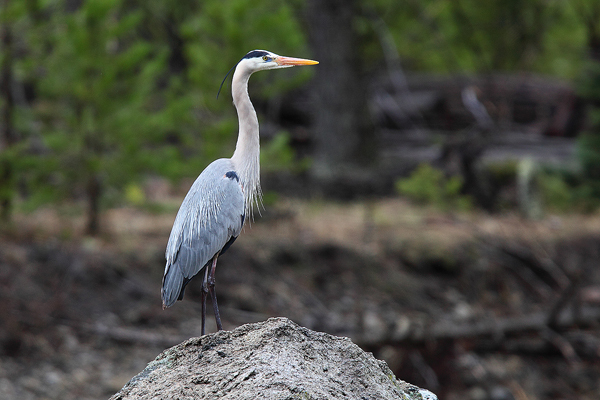 A great blue heron stands on a large boulder in the Madison River. 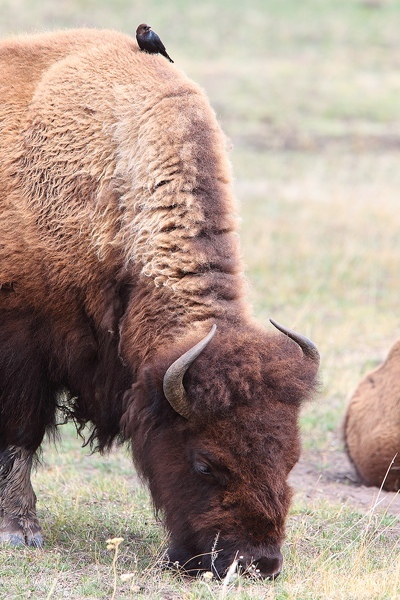 The next morning we made sure to get to the bison kill way before sunrise hoping to see wolves. As is pretty typical, coyotes were on the scene first. 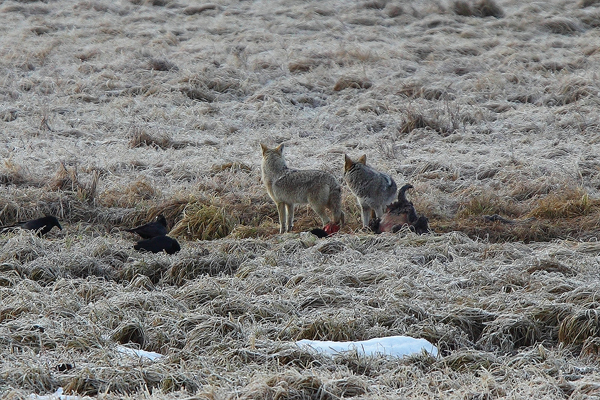 Coyotes are always very nervous while picking at kills. They know they don't have much time before much larger predators will be on the scene. The whole time the coyotes were on the kill there were wolves howling back and forth to each other from the nearby woods. The coyotes definitely were taking notice. Paul and Ian waiting on the wolves. 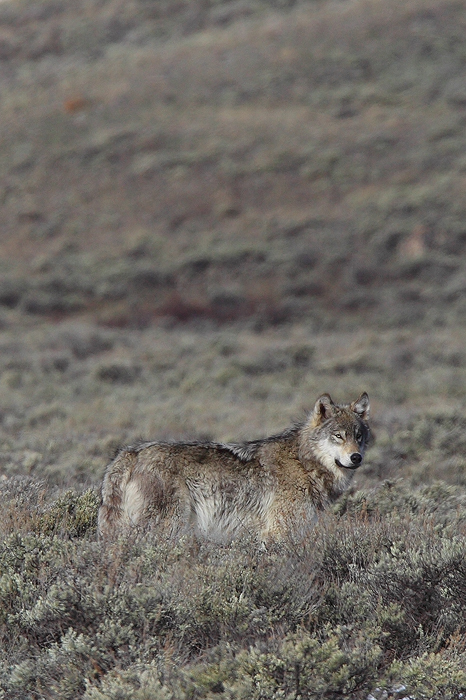 They had stopped howling about an hour earlier but we were still optimistic that they would show up. Finally after a few hours of waiting we spotted the pack behind us. 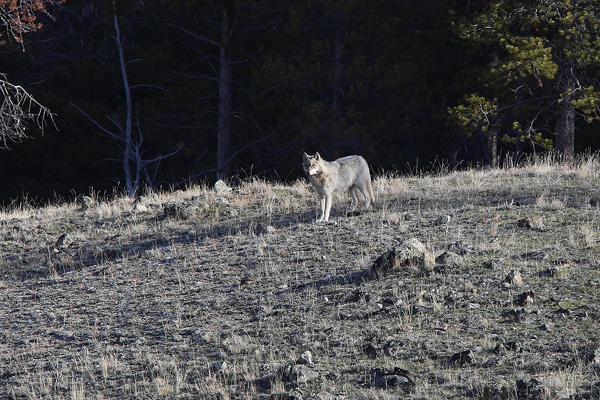 This beautiful grey was the first to appear at the crest of a hill. Then a gorgeous white wolf appeared out of the shadows. Another small grey came out of the woods below the hill where the others were. 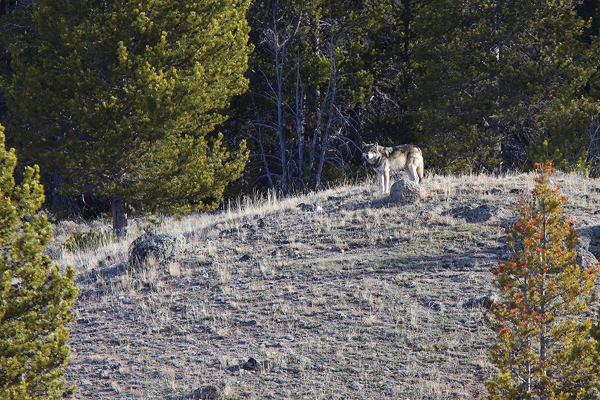 After this brief sighting the pack disappeared back into the woods. Luckily about 5 minutes later they popped out into the valley and the two alphas started to walk towards us. 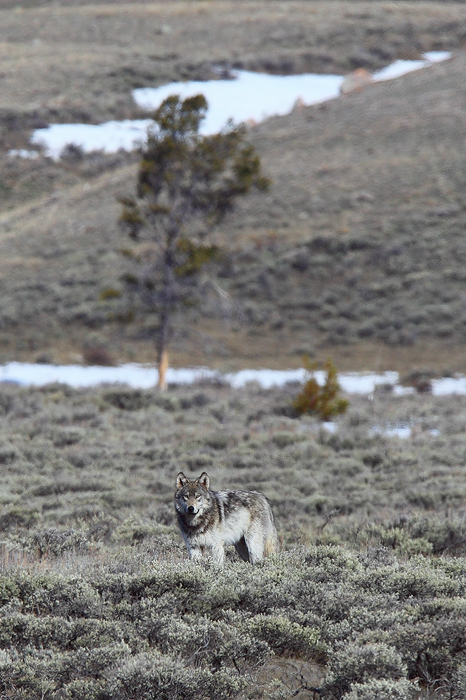 The beautiful large grey, who I believe is the alpha female pauses in the sagebrush. 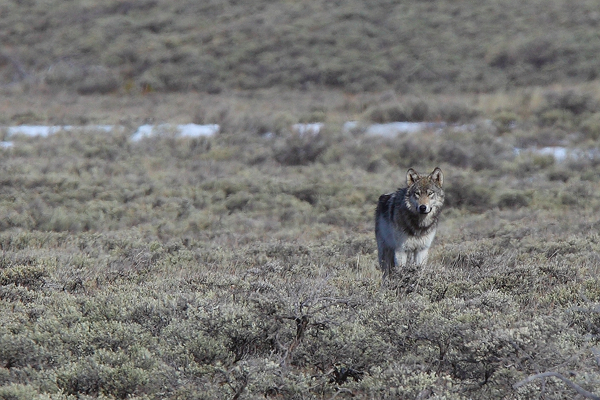 She seemed curious and came closer to us than any of the other wolves. 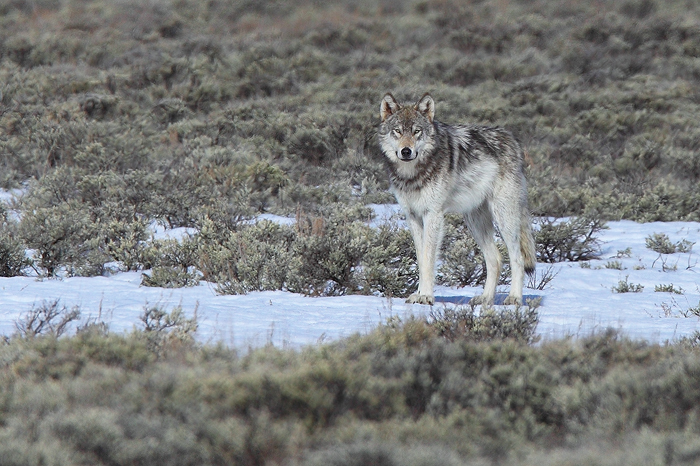 It doesn't matter how many times you've seen wolves in the wild. It's always a very special thing. They are hauntingly beautiful. 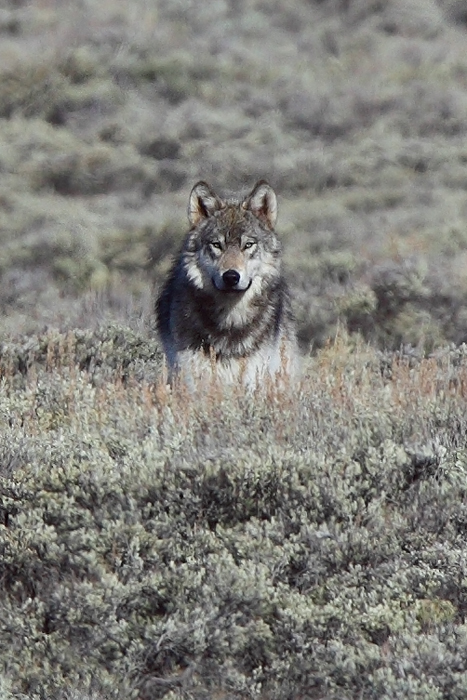 The same grey wolf deep in sage. 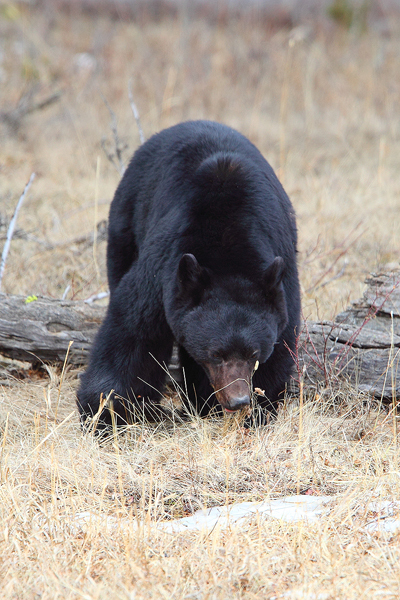 This is the large alpha male that we had seen a day earlier crossing the road. An unbelievably beautiful black and reddish wolf. 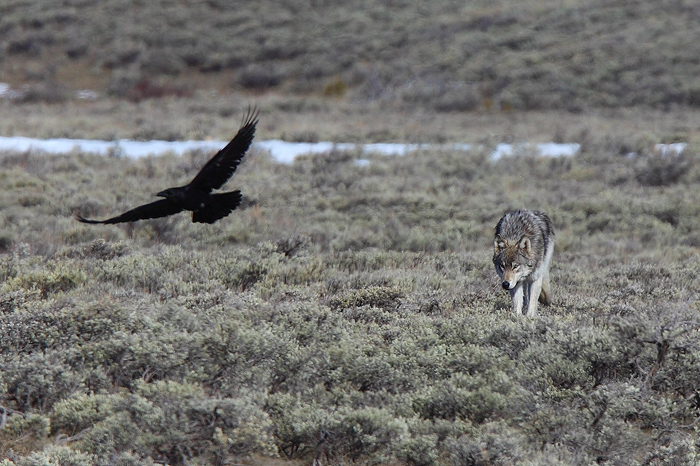 Wolves and ravens... at it again, as they have been forever. You normally see wolves deep in brush when their legs are hidden. When you finally spot one on flat ground you really start to get an idea of how large these creatures really are. 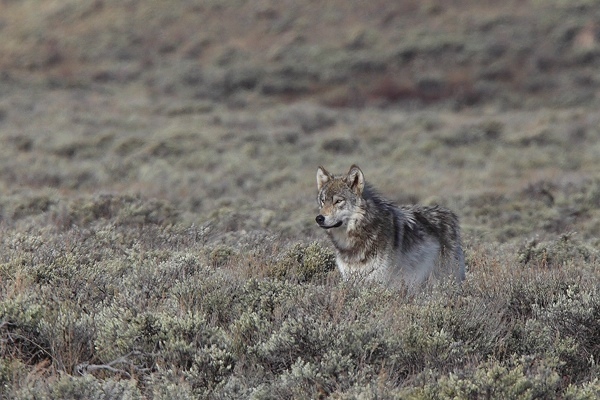 It's amazing how perfectly this wolf blended in with its environment. Without the help of a telephoto lens to separate her from the background it was hard to even tell she was there. 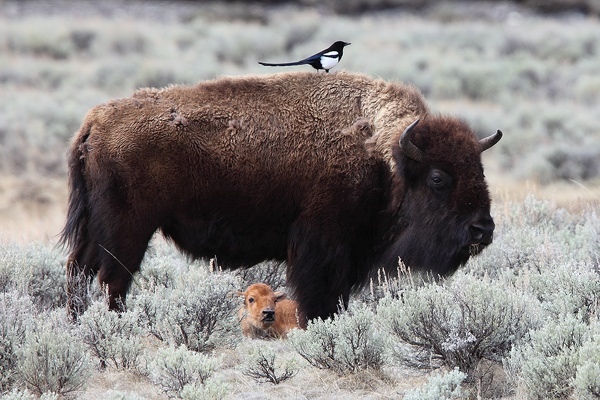 A magpie perches on top of a female bison as her newborn calf lays in the sage below.